Discussions Magazine Music Blog: Memories of MICHAEL JACKSON: Spaz pays tribute (sort of)! Memories of MICHAEL JACKSON: Spaz pays tribute (sort of)! I grew up listening to music. It was always around and was most definitely my first love. Well, platonic love, I guess. I was barely six months old when the Beatles infiltrated the U.S. market in 1964, but I don't remember that too well. When The Monkees first started airing in 1966, I was three and my folks later said that they could put my brother and I in front of the TV and that was the only half-hour of the week when we'd behave ourselves. I don't believe them. I'm sure we caused some kind of ruckus during the commercials! The first band that I totally latched onto as my very own was The Jackson 5. I think I was six at the time. 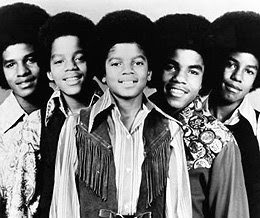 Sure, I loved all the stuff my folks played and I loved the songs blasting from the AM radio, but out of all the music I heard on a day to day basis, it was The Jackson 5 that fascinated me the most. Perhaps it was because there was an honest to goodness real kid singing the songs? Or it could have been that I loved things like "ABC", "I Want You Back" and "The Love You Save".... In any case, I loved 'em. One day, I was watching the J5 perform on TV and they did a song called "Going Back To Indiana" and I loved it! I was seven years old and asked my mom for their album (also called Going Back To Indiana) as a present for my forthcoming eighth birthday. That was their latest album at the time and I REALLY wanted it. Well, I didn't get it for my birthday that year (1971). Was I bummed? I don't think so. I was eight and there were probably plenty of cool toys to play with, so I probably just forgot. BUT a few days later, my mom says that my Aunt Wendie was going to come over and wanted to know what I wanted for my birthday. I suddenly remember that I didn't get the Going Back To Indiana album by the Jackson 5 so I asked for that, excitedly. Wendie shows up the next day with an LP sized gift and I was overjoyed! I quickly opened it up and, there it was, the Jackson 5's Maybe Tomorrow album! YIPPEE! HOORAY! Wait just a minute, there, bucko! Did I see that correctly? BUT I WANTED GOING BACK TO INDIANA!!!!! A few years later, I took great pride in the fact that my man, Michael Jackson, sang the theme song to the movie Ben. My brother and I were big fans of the movie Willard, so we were super excited about the sequel, Ben. And since we were kids, we loved the movie. And, oh my goodness, that theme song was perfect for the ending of that movie! Or so I though when I was 9 or 10. I guess I still do now, but I have to pretend that I don't in order to uphold my macho appearance. I've followed Michael's career since then, but I never reconnected with him and his brothers like I did when I was a kid. I don't regret that at all because I know that gazillions of other people were there to pick up the slack! So today, when I think of Michael Jackson, I don't think of anything sad (as you can probably tell by the tone of this blog post). I don't think about the scandals. I don't think about the controversy. Today, I celebrate the music he leaves behind. I celebrate that music that helped me to appreciate diversity. I celebrate the memories. Thanks, Mikey! You know, I never did get that Going Back To Indiana album!